CamelCrusher is a high ranking free distortion plugin that has been available for many years and is used by many producers. So chances are, you have probably heard of this plugin, or are already using it. If not, then you’re in for a treat! CamelAudio has a couple plugins, CamelCrusher and Alchemy (synth) are the most known. Unfortunately CamelAudio isn’t developing plugins and sound libraries anymore since 2015. However, CamelCrusher is one of the best free distortion plugins I ever came across and absolutely worthy of a review here at Typhonic Samples. First of all, lets hear what CamelCrusher can do. 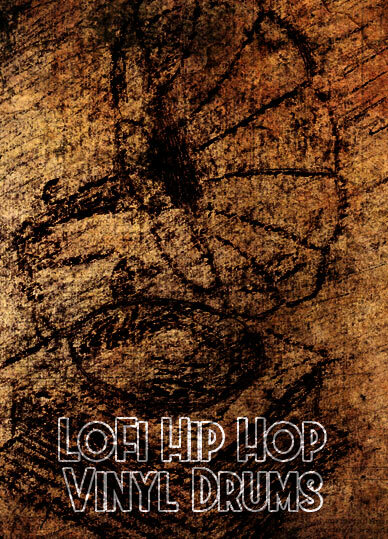 The first audio file is the original sound, a preset of our Skull Crushing Bass pack. The other 3 are edited with Camel Crusher. 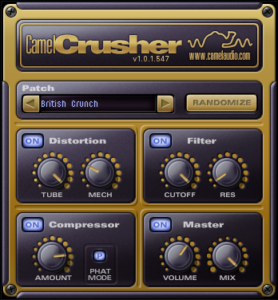 CamelCrusher is divided in 4 main sections: Distortion, Filter, Compressor and Master. You will also find a preset selector and a randomize button. This plugin comes with 20 presets, each giving a unique sound. The randomize button randomizes the distortion, filter and compressor section if they’re turned on. Each knob is for the amount of distortion type you want to add. The Tube Distortion has a kind of analogue feel to it, while the Mech Distortion is more dirty and mechanical. You can use both at the same time as well. Like most plugins, CamelCrusher has a low-pass filter where you can set the Cutoff and Resonance. The Cutoff knob determines at what frequency the higher frequencies should be cut. The Resonance knob boosts the frequencies at the cutoff point. Tip: Try to use automations on the Resonance. CamelCrusher gives you a simple, but powerful compressor. The Amount knob lets you set the amount of compression that is applied to your sound. And then there’s the Phat Mode. Turning this mode on adds a rough edge to your sound, depending on the amount of compression you’re using. Also the Master section gives you two knobs. First is the Mix knob. This allows you to determine how much treated and untreated signal you want to hear. Turn it to the right to only hear your treated signal. With the Volume knob you can adjust the overall level of CamelCrusher’s output. I’ve made 2 presets for CamelCrusher which you can download here (instant download). Both are used in the audio examples at the start of this review. In my opinion the beauty of CamelCrusher lies in the inside. However, to please the eye I’ve made 3 skins for CamelCrusher. 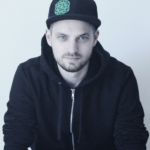 A very powerful and easy to understand plugin that every producer should have. The 20 presets that come with the plugin are fantastic and if you don’t like the looks, you can download our skins.